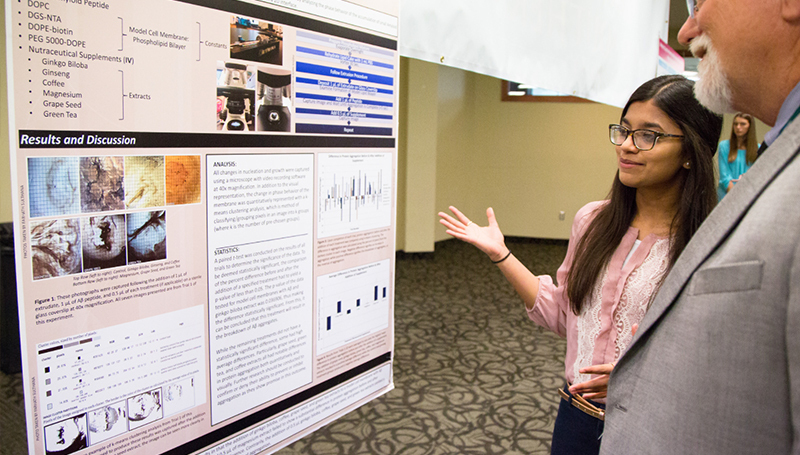 The 2018 Missouri Southern Student Research Symposium will be held from 1 to 4 p.m. Wednesday, April 25, 2018, in Billingsly Student Center’s Connor Ballroom. The research competition is open to students from all disciplines, providing them with an opportunity to showcase their research beyond the classroom setting. All students who are involved in faculty-guided research and creative activity are encouraged to submit an application for inclusion in the symposium. Entries can include current or past work completed in the classroom. Entries might include business plans, literature reviews, stories, music, artwork, theatre demonstrations or poetry, as well as technology, science projects, theory developed using mathematical tools, surveys or data analyzed using statistical techniques. Students will then create a poster presentation in which they share their work visually with faculty, staff, fellow students and community members. Students in the humanities category will have the option of presenting their work through a 10-minute oral presentation/performance. First and second-place winners will be awarded in each of the six categories. Winners will receive an Amazon gift card in the amount of $100 for first place and $50 for second place. There will also be a top prize of $100 for the best overall poster. More information regarding the Student Research Symposium and the application process is forthcoming, though please note the application deadline will be 5 p.m. Monday March 26. The submission process will open on Monday, Feb. 5. Further details will be available soon atwww.mssu.edu/research-fair. If you have any questions, please contact Dr. Michael Howarth at ext. 9748 or Howarth-m@mssu.edu.